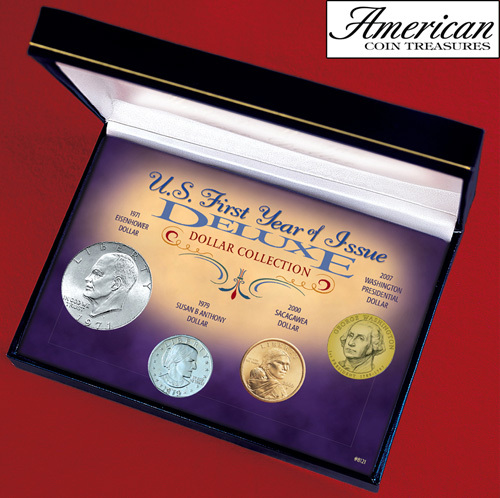 Portraits of great Americans appear on the historical coins in our First Year of Issue collection. The set rests in an elegant gold-stamped display case. The 1971 Eisenhower dollar honors the World War II hero who became our 34th president; the 1979 Susan B. Anthony dollar, the 19th century temperance and women's suffrage leader, the 2000 golden Sacagawea dollar, the heroic Shoshone guide of the Lewis & Clark Expedition, and the 2007 Washington presidential dollar, our 1st president and the Father of our Country. Certificate of authenticity is included.